Here's the outfit I wore to the holiday party I went to over the weekend! Super fun and sparkly, right? 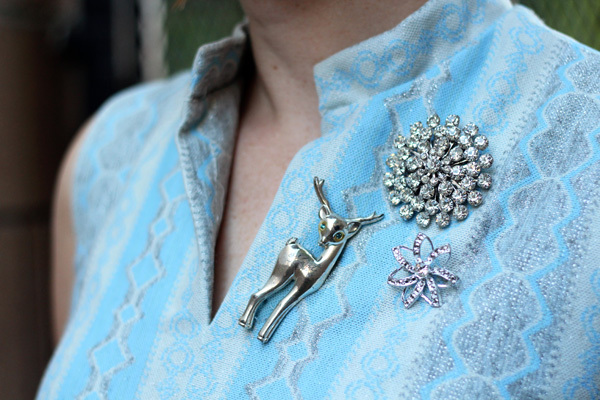 Well, here's the story of this dress and why it's covered in brooches. It started it's life as a much wider, much longer maxi dress. Even though it didn't fit, it was love at first sight when I found it at Beacon's Closet that day years ago. I knew it would be the most complicated alteration I'd ever done, but I was up to the challenge! I had plans to wear it to a 60s soul dance party in the near future, so I got to work. First I hemmed the skirt up (easy). Both the bodice and skirt were then carefully removed from the waist section. After that the bodice and waist were both taken in a bit. Finally I connected everything back together. It actually worked! I had taken this beautiful thing apart and made it fit without ruining it! There was just one tiny problem. The collar was creased a bit funny and it was really bothering me. Looking back I want to scream to myself "It doesn't matter! It looks fine!". But alas, I don't have this ability. I heated up my iron and pressed it against the neckline only to pull away a big melted piece of metallic polyester. And that, my friends, is why you see a cluster of brooches on this dress. The deer is perfectly hiding the patched hole I made that night. Always check your iron temperature before pressing a polyester dress you just spent hours altering! I'm linking up with Rolled Up Pretty and Transatlantic Blonde.